Thanks to Hylaphone here on ARF, I finally have a real meter calibrator. Nothing to add, but one comment- the DC reference supply (12.6, 6.2,....) "floats" with no ground return. How does connecting TP4 to a scope ground short out anything? Follow the circuit, and you'll see no connection to either the chassis or AC ground. With many HP instruments, Ground is rarely a "reference" point - many calibration adjustments are often referenced an internal isolated DC supply, as is the case here. The "-S" line is the zero volt reference for the DC reference supply, and according to the schematic it is connected to the chassis ground at the selector on S2. Perhaps I'm not reading the test point call-outs properly. The manual is vague on where they actually are, it just calls out "test point 1". There are circled numbers on the schematic, and I'm guessing they are the test points. There are circled numbers on the schematic, and I'm guessing they are the test points. The 6920 is a nice addition to the bench, and in addition to its calibration duties, it's also useful as a current and/or voltage source for tests the bench. The HP3468A is a true RMS meter. The AC source to the 6920B would have to have extremely low harmonic distortion for the HP6920B output to be adjusted to match the reading on the HP3468A. 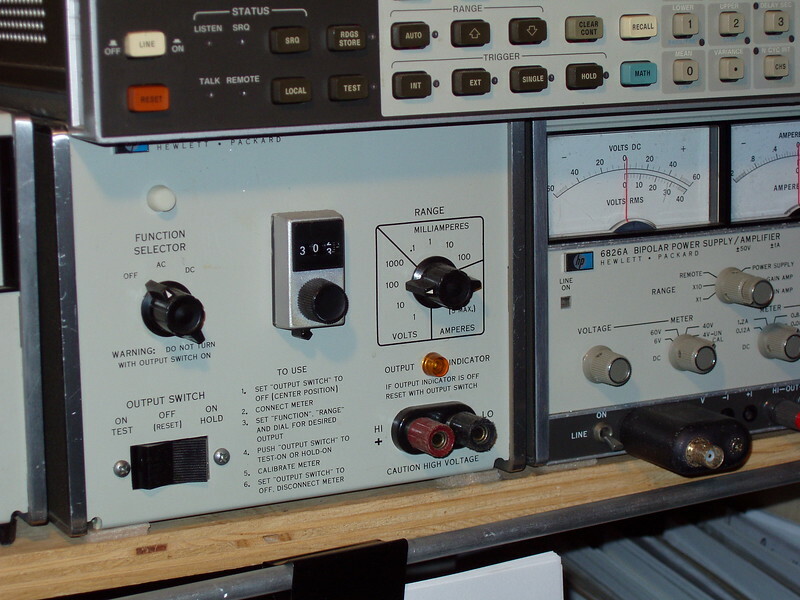 An average sensing RMS calibrated meter could be used or an external AC sine wave oscillator could be connected to the terminals on the rear of the HP6920B. Thanks Alan. I don't have an accurate average-reading AC voltmeter, but I can drive it externally from a 200CD.